We bring qualified massage therapists right into your business or event. Exceptional professional chair or table massage at competitive rates. 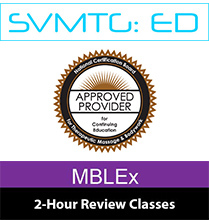 SVMTG offers inservice and continuing education training for massage therapists, including a popular review course for the industry's licensing exam - the MBLEx. We pride ourselves on our ability to help your employees recover and relax. We offer turnkey chair or table massage services throughout the SF Bay Area. We accept cash, debit, VISA, American Express, Mastercard and eCash transfer services such as VenMo and ApplePay. We offer invoice billing for companies. 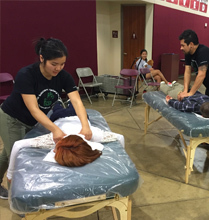 On-site chair massage therapy sessions are typically 15-20 minutes and longer sessions (30-60) are also available. Your session time includes a short assessment of your needs, as well as a short evaluation after your massage. Plan to arrive at least 10 minutes before your scheduled time. If you'd like to cancel a chair massage reservation, you must contact our offices at (408) 260-2256 or send an email with "cancellation" in the subject line to info@svmassagetherapy.com within 24 hours of your reservation. If you fail to cancel within 24 hours of your appointment, a same-day cancellation fee of up to 100% of the scheduled service price will be automatically charged to your account. If you need to reschedule, you must do so at least 48 hours prior to your reservation to allow for us to reschedule your therapists. We work by appointment and sometimes we're busy! We take reservations up to 6 months in advance, but sometimes we can work on short notice (about 3 days is minimum notice). We take your health and wellness seriously. We're also very conscious of taking care of our environment and serving up the highest quality, locally-sourced products. We use and sell essential oils, therapeutic blends, massage oils, lotions, facial and aromatherapy products from Elizabeth Van Buren, Face Reality, Tuel and Biofreeze.